These are also the recommended default Speed Up Settings for DualShock 4 Wireless Controllers. The recommended Speed Up Settings when using a DualShock 4 Controller with a Bluetooth 4.0 USB Adapter are as above - you can choose to tweak with them if you have any issues. 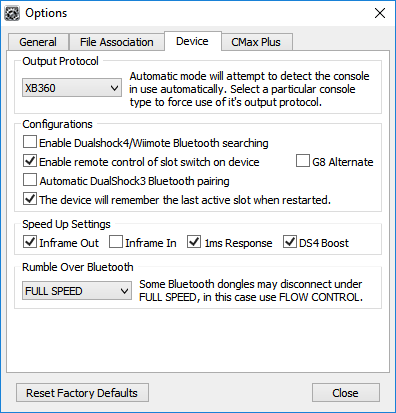 If you have a slower Bluetooth adapter or experience any issues with rumble then you should try different 'Rumble Over Bluetooth' speed settings. You have the alternative options of Flow Control+, Flow Control and Disabled. Connect the CronusMAX PLUS into one of your Windows PC USB ports via it's Output Port. Press and hold the SHARE and PS buttons on your DualShock 4 until the light bar starts to flash white. Once it starts flashing white, the controller is searching and connecting to the CronusMAX PLUS. After a few seconds, the light bar should change to a solid color (usually blue if Player 1) and is now paired with the CronusMAX PLUS. 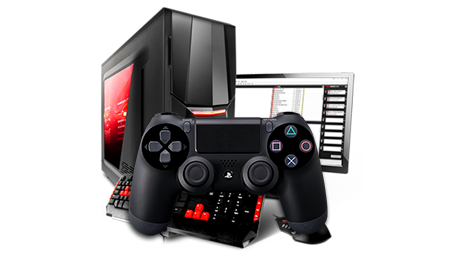 Note: If you have trouble pairing your DualShock 4 controlle back to your PS4 without using a CronusMAX, follow this troubleshooting guide on our forums. Click Here for a comprehensive guide on how to solve lag problems. If you do not intend to use your DualShock 4 controller without the CronusMAX PLUS in the future, you can now disable DualShock 4 Bluetooth searching to speed up subsequent DualShock 4 wireless syncing.